Microsoft has issued an emergency security update to block an avenue of attack first seen in “Flame,” a newly-discovered, sophisticated malware strain that experts believe was designed to steal data specifically from computers in Iran and the Middle East. According to Microsoft, Flame tries to blend in with legitimate Microsoft applications by cloaking itself with an older cryptography algorithm that Microsoft used to digitally sign programs. “Specifically, our Terminal Server Licensing Service, which allowed customers to authorize Remote Desktop services in their enterprise, used that older algorithm and provided certificates with the ability to sign code, thus permitting code to be signed as if it came from Microsoft,” the company said in a blog posting today. Mike Reavey, senior director for the Microsoft Security Response Center, said Microsoft isn’t so concerned about Flame, which is now well detected (finally) by antivirus programs, and appears to have spread to a very small number of select systems. Rather, the company is worried that other attackers and malware might leverage the same method to aid in phishing attacks and other schemes that impersonate Microsoft to gain user trust. The update released this week (KB2718704) blocks software signed by these Terminal Server License Service certificates. 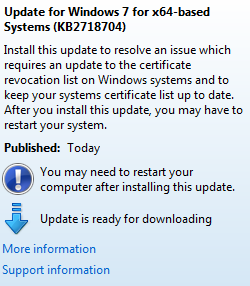 Updates are available for virtually all supported versions of Microsoft Windows. The patch is currently being pushed out through Windows Update and Automatic Update. This entry was posted on Monday, June 4th, 2012 at 9:52 am	and is filed under Latest Warnings, Time to Patch. You can follow any comments to this entry through the RSS 2.0 feed. Both comments and pings are currently closed. It is curious how ‘flame’ has managed to stay within the boundaries of the immediate Middle East. You would think it would spread like wildfire, just like so many other new variations of modern malware. Maybe it has something to do with certain countries’ fastidious firewall policies; and their penchant for blocking free information. Flame was probably used as a weapon in cyberwarfare. It was not designed to spread. Hence it did not spread. What one should be worried about now are derrivatives of these kinds of malware that are designed to spread / build new botnets. This is exactly why this security update was issued, to make it harder for others to use the same (exact) approach. Of course if malware developers manage to get their porgrams signed by other (still) trusted authorities one is still an inclined plane wrapped helically around an axis. It’s quite simple – Flame didn’t spread. And if Flame did spread, then I really don’t think “firewall policies” could stop it. Flame had the ability to spread via USB (autorun and .lnk like Stuxnet) and via exploits (print spooler vulnerability like Stuxnet), but neither of the ‘spreading mechanisms’ was turned on. fwiw, WinXP required reboot, Win7 x64 didn’t. Hi Brian, I’ve been meaning to write for a while now to say, simply: “Thank you.” Thanks for all you do to help us stay current on potential problems. I’ve been reading your blog for years (since you were still with WaPo), and I have to admit that I’m often reluctant to install an update that’s been pushed to my computer (Microsoft or otherwise) until I’ve read a post from you on what it’s all about. So, again, thank you. Very much. Thanks Xari, for your loyal readership. I’m very glad that I’ve been able to produce the type of content that keeps you coming back! This is FAR more dangerous than it seems! According to F-Secure, Flame had a module which attempted a man-in-the-middle attack against Windows Update! This means that had the creators – presumably the US and/or Israel – gotten some code wrong – as they DID with Stuxnet which allowed Stuxnet to spread – this malware could have spread to scores or hundreds of millions of PCs worldwide! The fact that it DIDN’T is no reason to be complacent! In my view, this puts Obama in the “impeachment” category since he authorized this crap. You had me until your final sentence. Good thing it has an update for that now. I used to think that my Win 7 was like a foreign friend to me due to the many issues it had – that seem to be too bothersome to fix. When I got this update I wasn’t sure what it was for, but thanks for this info! what’s a bsd user? I never heard the term. A “bsd user” is someone that uses BSD Unix, one of the many derivates of Unix. @log is insinuating, incorrectly, that Unix users don’t have to worry about security issues like Flame. Especially since Flame has been hidden for what 2 years? Yes; I’d imagine it wouldn’t take too much for a criminal to modify such malware to exhibit (strategic)worm behavior, and still be undetectable for some time. they don’t have to worry about the thousands or millions of malware like windows users do, that’s a fact. rootkits for *nix? sure, but nothing like there is for windows. The exploits and spoofing tricks it used to spread only would allow it to spread efficiently inside its local network, however the .lnk exploit could allow it to “escape” had it infected a USB key that was taken out of the area. Same deal if a mobile computer (laptop/netbook) was infected and brought to a new network. UNLESS it played some UPnP magic to mess with firewalls and routers, there is very low chance of it using MS10-061 to infect boxes on another network, and the spoofing/update hijacking trick is also only effective on the LAN.